Do You Want to Become a Teacher? - SchoolFinder.com! Are you are interested in becoming a teacher? Start by exploring the Master of Teaching in Elementary and Secondary graduate program at the pre-eminent Ontario Institute for Studies in Education of University of Toronto. Upon successful program completion, you can become a Canadian-qualified teacher with a graduate degree from the prestigious University of Toronto and a teacher certification which is widely respected around the world. Moving to Become a Teacher The University of Toronto has offered teacher education programs since 1906. 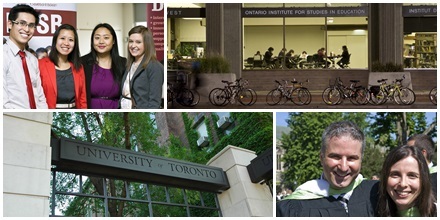 OISE is among the largest faculties at the University and one of the largest teacher education programs in Canada in terms of enrolment and services available. Our Master of Teaching graduate program combines a Master of Teaching degree with elementary or secondary teacher certification. It is suited for those who want to pursue a career in teaching combined with graduate study that may lead to a doctoral program. Moving to Toronto OISE is located in Toronto, Ontario -- a city where the population is one of the most diverse in the world. Toronto is the best of all worlds: our city’s living mosaic continues to draw the best and the brightest, who come here seeking world-class business, culture and education in one of the safest cities in North America. Moving to the University of Toronto Making the move to the University of Toronto as an international student means that you are not alone: we are proud to be home away from home to almost 10,000 international students from over 150 countries! Adapting to a new cultural environment and a new education system may present some unexpected challenges for our international students. Our Centre for International Experience (CIE) is always ready to help with a wide range of services and programs along the way and throughout the year. To our international students, the CIE offers: pre-arrival and arrival counseling; reception and orientation events; and social and cultural events, and many more. Discover more at CIE.
Make Your Move to Become a Teacher with OISE If you’re thinking about becoming a teacher, make the move by choosing the Master of Teaching program at OISE. Applications are open for September 2014 start. The application deadline is June 13.